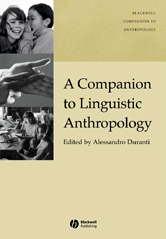 A Companion to Linguistic Anthropology provides a series of in-depth explorations of key concepts and approaches by some of the scholars whose work constitutes the theoretical and methodological foundations of the contemporary study of language as culture. Provides a definitive overview of the field of linguistic anthropology, comprised of original contributions by leading scholars in the field. Summarizes past and contemporary research across the field and is intended to spur students and scholars to pursue new paths in the coming decades.